At Archery Headquarters Academy, we’re aiming for the future. Join us and experience the excitement of archery for yourself and your family. Archery Headquarters Academy offers a comprehensive array of archery lessons for students at all levels of proficiency. Our certified archery instructors also deliver a wide range of programs and activities tailored to appeal to children, adults and families in a safe and structured environment. Low-cost archery lessons are specifically designed to provide an overview of the available styles of archery available at our facility, allowing you to make an informed decision about your preferred training method and style. We also offer exclusive lessons designed to supplement home-school and charter school programs. We provide the equipment for these unique and customized educational programs. At one time, archery was mainly used in combat and in hunting. 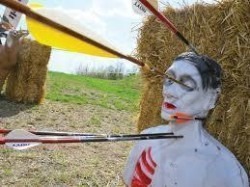 In today’s world, archery is considered a sport and is also still used as a means to hunt. Thanks to many popular movies, such as the Hunger Games, archery has gained in popularity and everyone including men, women and children of all ages are wanting to either learn archery or enhance their skills. Archery Headquarters Academy is the perfect place for both. Our certified instructors give archery lessons to students ages eight and up in a completely safe environment. We offer low-cost introductory courses and also offer unique educational opportunities for students in both home school and charter school programs. At Archery Headquarters Academy, we offer elite archery training services for students at all levels of knowledge and expertise. We are committed to providing the most effective and innovative training techniques and strategies for our students. Archery offers numerous benefits for younger students and can help them to develop valuable social and physical skills that will help them succeed on and off the range. In addition to archery lessons, Archery Headquarters Academy also offer summer camps. If you are concerned about the heat, we have an indoor archery range. If you still aren’t sure whether or not archery is for you, Archery Headquarters Academy has educational and instructional events for both children and adults. Our corporate events packages are the perfect way to find out more about archery along with teaching team-building skills. One of our most popular packages includes the Zombie Apocalypse, where you can see if you have what it takes to keep your team alive. If you’re looking for a unique place to host your child’s next birthday event, we can do that too! It will be a birthday celebration your child won’t soon forget. All you have to remember to bring is the birthday cake and Archery Headquarters Academy will do the rest. Whether you are looking for something unique to do, wanting a new hobby or sport or want to increase your archery skill to the next level, Archery Headquarters Academy is the perfect place.